To those that know me in person, THIS is what I was carrying around in my backpack spring semester. To those that know me online, THIS is why I didn’t blog during spring semester! Depeche Mode is my contribution to the latest (80’s Love) issue of Tangled! 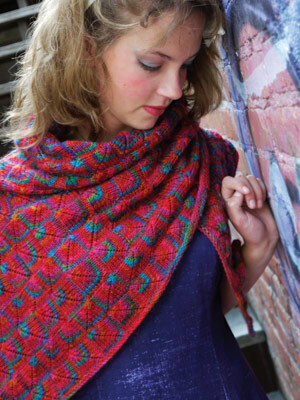 Designed with variegated and leftover scrap yarns in mind, this shawl is knit in one piece by picking up stitches to join one square at a time. Variegated yarns will produce lovely stripes, and the one-piece construction makes it easy to work with multiple yarns. 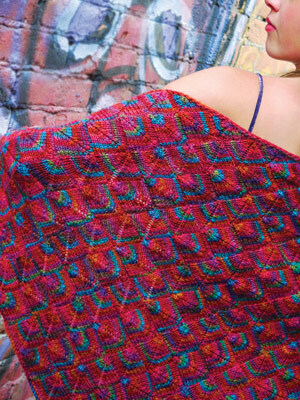 The easy modular knitting is fast and fun… Depeche Mode truly is the perfect name for this design! $6.00 USD at Tangled! Click here! If anyone is up for doing this as a KAL, be sure to let me know. This sample has gone off to live a good life at Sock Summit with Team Tangled, so I definitely need another for myself. Working on this pattern was a great experience, and I’m glad I didn’t have to struggle with photography this time. Hi. Would you tell me what colorway of Bearfoot you used to make Depeche Mode? I would love one exactly like yours. I bought the pattern today and can’t wait to get started.